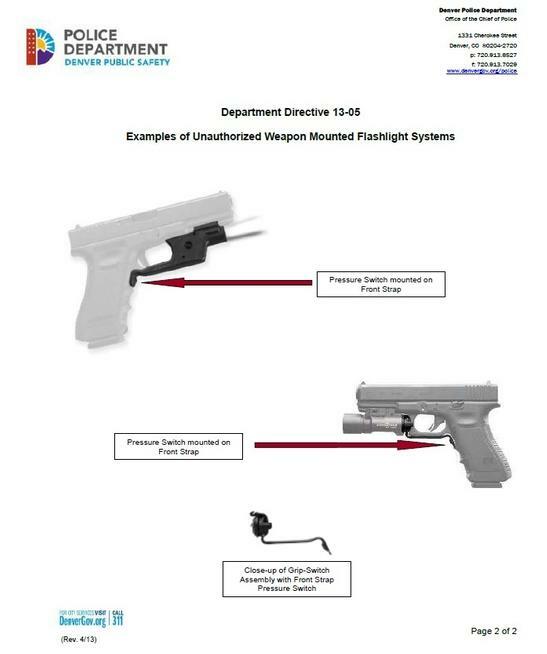 The Denver Police Chief is promising extra training and a review on the use of new flashlight equipped guns after a series of cases where officers fired a round while trying to find the switch for the light. This accident-waiting-to-happen technology could spawn a series of lawsuits for both negligence in the officers the Department as well as product liability claims. There have been at least two accidental shootings and five accidental discharges in the last year. In Texas, a man is dead and the confusion over the flashlight is suspected as the cause. 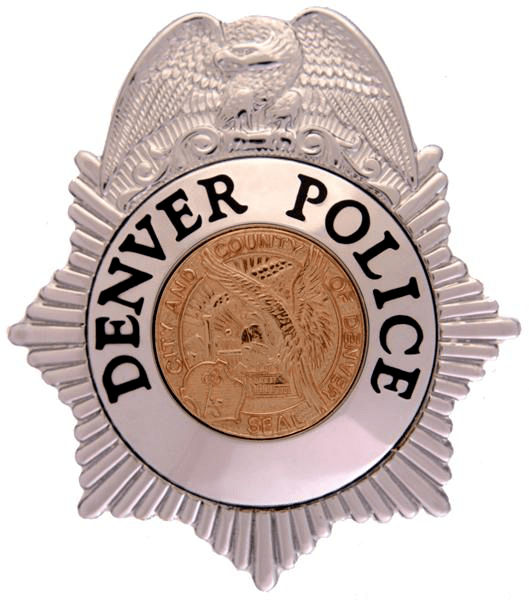 Denver is banning one design of the technology entirely while reviewing the devices generally after the shootings. In the last week, two people have been injured in incidents involving the flashlight-equipped weapons. An example of such a gun is shown below. Tactical flashlights are mounted on the weapons to shine the light where the gun is pointed. However, that also increases the likelihood that an accidental triggering will hit a suspect. In one case in Plano Texas, Anthony Alcala, 25, was shot and killed by a narcotics officer trying to operate the flashlight while in New York, Jose Colon, 76, was shot in the stomach due to the same confusion. Notably, SureFire LLC settled a lawsuit brought by the family of Alcala. The concern is that the technology was originally designed for Navy Seals who are far better trained in the use of such weapons. SureFire could be looking at additional lawsuits. There are more than 100,000 handgun-mounted lights in circulation and, even with warnings, this could be viewed as a case of foreseeable misuse in a product liability case. The confusion bears striking resemblance to the cases involving accidental shootings by officers thinking that they were holding a taser rather than their service weapon. LMAO, so many comments by folks who don’t know what they are talking about. Go through a few CQB courses then speak to this. The solution to this is easy, get rid of the pressure switch, it’s not necessary, use the flip switch the light came with. If you aren’t coordinated enough to use it then cross draw your light. With the hundreds of light options I wonder why this is even an issue. The pressure switch under the trigger is tough to use, try holding it down and pulling the trigger… takes some practice. Oh and Roger, when you have to draw your gun on scene you are pointing it at everyone who’s not in blue, it’s clearing a room, the basic rules of gun safety go out the window. You draw your gun to be ready to shoot someone if needed. The rules of gun safety apply to target shooting, completely different rules for LE clearing rooms. Tactical flashlights are not ordinary lights. The really good ones do use LED technology. Mine is not much bigger than an ordinary 2-AA battery flashlight, and has a bulb about the size of a grain of rice. However, it puts out 24,000 candela and rated to illuminate clearly at 310 meters. If a bad guy tries to look at it, it’s almost like looking at the sun. Can’t do it. Not necessary to decouple the light and weapon. I am a fan of head mounted lights, point one’s head in the direction that one wants to look and the light goes there. LED based lights are getting brighter, while neither of the ones that I possess is bright enough for searching a building I imagine that such that are are available now for a premium price and will be available cheaply within the next few years. Using headlights would decouple the direction in which one’s lights and weapon are pointed. I’d argue the problem is a training issue. If there is an accidental shooting, chances are the officer had his finger on the trigger before he was sure of his target. If officers are properly indexing their firearm while investigating areas with a light, then they are less likely to jerk the trigger when surprised by something appearing in the light before them. One problem with weapons-mounted lights is that the muzzle will be pointed where the light is directed as the room is swept. This can include the suspect’s 8-year-old child, the thin wall separating the adjacent apartment where a family is sleeping, or even another officer. A cardinal gun safety rule is “do not point the firearm at something/someone you are not willing to destroy.” Really, the old method of holding a light with the weak hand is much safer for everyone. True, it is harder to do with a carbine, but I would ask why police are now routinely carrying carbines when serving warrants, particularly since theirs are true assault riles, i.e., fully automatic rather than semi-automatic. The militarization of American police is another subject, but the “tacticool” weapons-mounted lights and the full-auto carbines are part of this trend. As for the Taser analogy it is a close analog to what is happening here. In the case of officers shooting someone when they intended to actually draw the Taser it is the same process. Thinking of one motion and responding as habit with another. In stress situations people will, if trained, will usually revert to that training. If the training is bad or is not fully complete it can result in incidents such as this. The easiest solution to the Taser / Pistol swap was to carry the Taser with the weak hand, that is the opposite hand that is typically used to shoot the pistol one handed. That way officers, as a failsafe, are trained to draw pistol strong hand and Taser weak hand. In the tactical light in question in this article the solution is to use a different motion to activate the light that is markedly different than the trigger pull. That is why the easy solution is to use a switch on the flashlight itself. I wouldn’t agree with that statement as it is too broad. The problem is not the tactical flashlight itself, it is the switch that is in this case. A well lit area is actually better and less likely to result in an unwarranted shooting. What Darren said. I can’t imagine putting a switch on the weapon in such a way that it could be triggered accidentally in a stress situation. For average police work, the switch should be on the flashlight. My Streamlight has a dual switch. One pushbutton on the side near the top where you would expect to find it. The second switch is in the tail of the light, where a light held head high can be thumb actuated. I don’t want a switch where I can miss and snag the trigger. I haven’t used this type of pistol mounted flashlight but I can see what the problem is. The pressure switch is under the middle finger, it might be the case where the officers’ grip was not enough to actuate the pressure switch and they went to clench the middle finger but reverted to the index/trigger finger out of habit. I can see how this would happen. I had a laser sight for my pistol at work and it was activated by pushing in a modified slide release which is on the sides of a Glock 17 slide. It was not actuated by the trigger and hence was more safe because it was a completely different motion to use it. The problem with these flashlights could be addressed by using one that has a on/of switch on the light itself that is easily discovered and used. It is in my view not that critical that a flashlight be activated instantly most of the time, such as having to rapidly draw down on someone. Most often these flashlights are used in building searches / dark areas / unlight vehicles etc. They are very good in this situation because when doing especially the first two it is awkward to have a regular flashlight as it takes away one of your hands and occupies both. The difference with the pistol mounted and hand carried flashlights can be quite different. Many guys I know are switching to the mounted ones. In fact from a safety standpoint it could be argued that having a flashlight right there and providing a good backlight might save someone because it can be the case where a dimly lit suspect might give the wrong impression in mind of the officer as to what is actually happening. It is not the flashlight on the pistol itself that is the problem here, it is the switch mechanism that is. Wayne, “mercilessly beating” isn’t used on the officers, it is used by the officers on mentally ill or Black citizens. One of the 4 rules of gun safety is to keep your finger off the trigger until you are ready to shoot. If the police are pulling the trigger while trying to turn on the flashlight, then they are not indexing their trigger finger (the index/trigger finger rests along the slide of the gun until you are ready to fire). This is a training issue & the department Range Safety Officers should be mercilessly beating this into the heads of the rank & file. “mercilessly beating” is an apt phrase and one that I’m sure will be followed. The light does not have to have the pressure pad switch on the grip. The light itself has a toggle switch. The setup they are using cuts well under half a second off of the time it would take to reach the index or middle finger out to hit the toggle switch. And doing so can’t possibly result in the trigger being pulled, the motions aren’t the same. Also, many, if not most, police forces don’t have weapon-mounted flashlights, so the officers are trained to use a separate light in their off-hand. The weapon-mounted light, if used as the primary light, forces the user to violate one of the sacred four rules of gun safety – pointing the gun at someone. If they can’t teach their cops to know the difference between a pressure switch located on the grip and the trigger, they’ve got several pretty easy solutions. How exactly is the flashlight supposed to be turned on? It looks like the switch is right where the middle finger would be. If the officer tried to use his middle finger to turn on the light while also having his index finger over the trigger, I can how flexing the middle finger may also cause the index finger to flex. This seems like a very faulty design. It also looks like the light could easily be turned on with the left hand (assuming a right handed shooter). If it’s right under the trigger guard, why would it be so hard to find? Perhaps Crimson Trace needs to develop a weapon light for police. For those not in the know, Crimson Trace makes weapon lasers where the switch to turn the laser on is part of the weapon grip. So you as you grip your weapon, the laser comes on. I’m quite sure a similar system could be used for weapon lights. I’ve used them and they can. It must be very disconcerting to look down and see a red dot on your chest, knowing it came from a firearm of some kind. I have one on a shotgun that is easily activated by the non-trigger hand. Bad things happen suddenly and police officers don’t have time to be fussing with their equipment—if a service weapon is drawn that means something bad is happening and their reactions depend upon repetitive training to the point where it is almost automatic. All that training and deadly “mistakes” still happen on a daily basis, with experienced and inexperienced officers. I hope the victims get fairly compensated for their injuries. Wayne, While most officers are professional and dedicated, there are far too many who are not. Plus when you arm the police militarily, which happens way too much these days, bad results are going to happen. Yes, I completely agree with the militarization of our police departments. It is an alarming trend that seemed to accelerate after 9-11. Federal funds for Homeland Security (A term that I really don’t like) became available and perhaps some of that went to local police agencies who spent it like they were equipping the 101st Airborne Division. And then with all that fancy military stuff they looked for reasons or excuses to use it. Then with the all the military “wannabes” came the abuse and excessive use of force—police officers acting like they were soldiers. Simple police actions saw the use of “swat teams” all dressed up in their regalia acting like soldiers and not police. This might anger a few folks, but it is my impression that the rogue cops want to be in a front line military outfit but don’t have the courage to join one. Yes, these rogue bully cops are basically cowards with a badge and a gun. It’s much easier to be a pretend Marine Recon Soldier or a Navy Seal when your opponent is a lazy overweight individual sitting at home drinking a beer while watching his favorite football team. These guys break down doors, yell and scream, act real tough and then go back to the squad room, or make believe barracks, and brag about their macho self image. Now before anyone climbs down my throat: no I’ve never been a police officer but yes I have been a soldier. With the exception of Military Police the two are mutually exclusive. Yup, the militarization of our police is out of control and I don’t know how it can be controlled. I just think that too many inexperienced officers have guns….. Some are not as well trained as one might think. I’m more concerned about an officer’s psychological profile than their competence on a firing range. I’m hearing and seeing way too many abusive actions by officers that border on criminality. Fortunately most are well trained and very dedicated to serving the public. It is unfortunate that we hear about the failures and not the successes. Officers do risk it all everyday and if I’m in trouble my first action will be to call 911. All the police officers I’ve come in contact with have been very professional and dedicated public servants. Ok, first one never puts a finger on the trigger until the weapon is going to be fired. However, the switch for this flashlight is ridiculous as under stress an officer could easily make a mistake. An officer with a gun drawn cannot be expected to look down at his weapon to find the “on button”….as that would be the exact time the bad guys would start shooting. I don’t have an answer for this situation but do know this is a handgun that I would never want to use. I do have a license to carry a concealed weapon and have taken several NRA pistol safety classes. This design is an accident waiting to happen and is an example where I would support a general ban on this design. This weapon/flashlight design is far more dangerous than the black evil looking so-called assault rifles. They never misfire on TV. Perhaps that misled the planners.